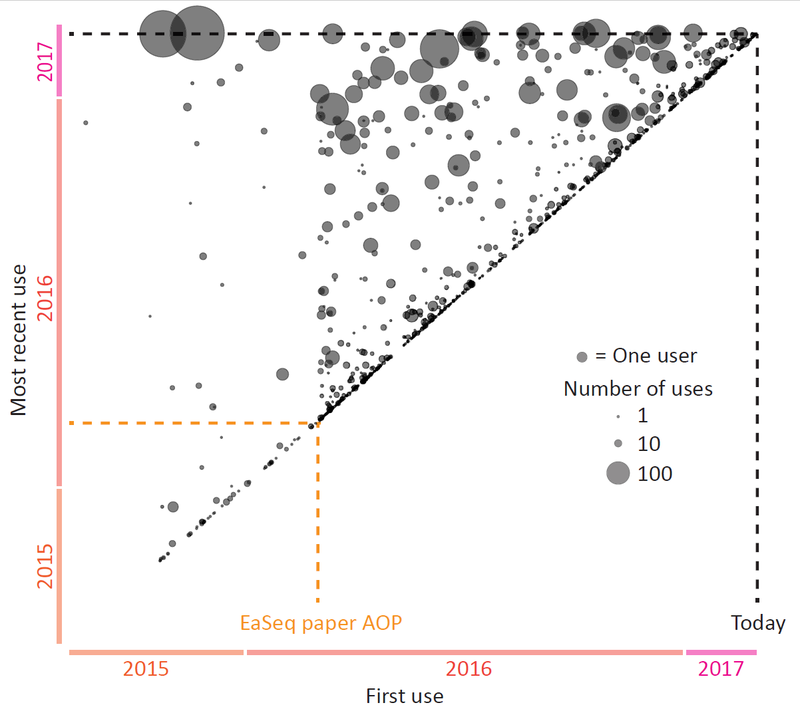 Today EaSeq turned one year old, counting from the day our paper went AOP. I have looked a bit into the statistics to get an impression of how many people (or more correctly: computers) that have been using EaSeq during the last year. Unsurprisingly, there is a large fraction users who install EaSeq and then abandons it. This can happen for number of reasons: (the good) the user migrates to a more powerful PC, (the bad) it does not really cover the areas that are needed or expected, and (the ugly) the user decides that it is too complex to use or too hard to learn using the program. It is probably common for most freeware programs that people try it out and move on. However, if you install EaSeq but decides against using it, then I would love to learn why – it would really be ignorant of me not to listen to your reasons and try to improve EaSeq accordingly. Therefore, please do let me know why if you decide not to use EaSeq after installing it. To all of you – regardless of whether you hang on or not – thank you for trying EaSeq, and good luck with your projects!